Women’s hockey has faced a tough schedule in the past two weeks, playing both Eastern College Athletic Conference foes and top talent in the country. The team went on a difficult road trip to play two key Ivy League opponents last weekend in Brown University and Yale University. On Jan. 26, the Big Green faced off against the Bears, who despite their record of 2-19, proved to be a tough matchup for the Big Green as they came out with a strong offensive attack and solid defense, posting two goals and allowing only one shot from Tess Bracken ’19 to find the back of the net in the first two periods. The Big Green responded well in the third period however as Bracken proceeded to put on a show, netting two goals, including the game-winning goal with only 45 seconds remaining in regulation. Brown was unable to find an answer for Bracken’s offensive efforts as her first career hat trick proved to be just enough to get the Big Green a vital 3-2 victory in Providence, Rhode Island. Though Bracken was able to fill up the box score for the Big Green, she wasn’t alone in putting in the work required to pull out this important win. Several other players had strong performers for Dartmouth. Their efforts went beyond the scorecard but did not go unnoticed by their teammates. Captain Hailey Noronha ’18 noted Christina Rombaut ’20’s performance. The road trip ended on a bit of a sour note for the Big Green, however, as it suffered a 6-0 loss to Yale in New Haven, Connecticut. The first period featured a fairly competitive matchup between the Ivy League rivals, but a four-goal second period for the Bulldogs proved to be more than enough for a Yale win. The tough loss hurt the Big Green as every ECAC is important for the playoff picture. Though Dartmouth fell to a 5-17-1 record on the season, there were positive takeways from the weekend. The team played a gritty game against one of the nation’s top teams in Cornell and is looking to pick up a few wins this weekend against Rensselaer Polytechnic Institute and Union University. These games will determine the fate of this Big Green team as it tries to make headway in the ECAC standings and work toward a playoff berth. The women are in 11th place, ahead of Brown only. To make playoffs, the Big Green will have to finish the regular season ranked within the top eight of the conference. 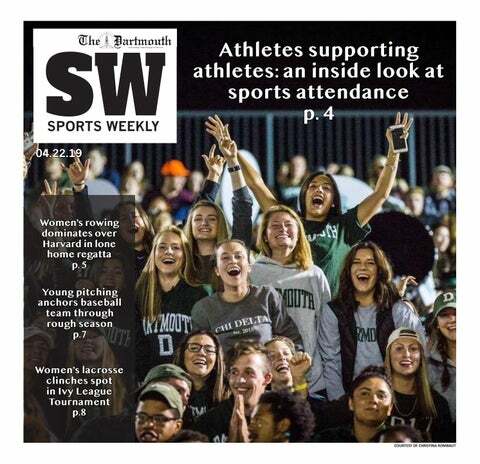 Dartmouth is scheduled to face off against RPI at 6 p.m. at Thompson Arena on Friday as it looks to pick up a crucial win to kick off its Winter Carnival home stand.